Immune complex (IC)-mediated glomerulonephritis constitutes majority of the glomerular diseases diagnosed on renal biopsies. Adequate evaluation of these biopsies requires light microscopy (LM), immunofluorescence (IF) staining for characterization of the type of IC deposits and ultrastructural examination for localization of the deposits (mesangial, sub-endothelial, intramembranous or sub-epithelial). Localization of the IC deposits has some clinical and prognostic value in diseases like IgA nephropathy (IgAN) and lupus nephritis. , However, the facility for ultrastructural examination is not always available, particularly in developing countries. Thus, other techniques like fluorescence of hematoxylin-eosin (H & E)-stained sections have been attempted to detect and localize IC deposits, , but have found limited applicability due to procedure-related and other factors. This study attempts at describing a novel, yet simple, technique of digital image inversion of IF images for localization and quantification of deposits in immune-mediated glomerular diseases. A total of 30 cases of IC-mediated glomerular diseases were included in this study. These included five cases each of lupus nephritis class III and IV, IgAN (with and without capillary wall deposits), idiopathic membranous glomerulonephritis (MGN) and membranoproliferative glomerulonephritis (MPGN). All the renal biopsies were processed using standard protocols for LM, IF and transmission electron microscopy (TEM). For LM, routine staining with H & E, periodic acid Schiff (PAS) and silver methenamine (SM) stains was performed. Frozen sections from the tissue were preserved for direct IF examination and were cut at 6 μm and stained using fluorescein isothiocyanate-conjugated antibodies to IgA, IgG, IgM and C3c (The Binding Site, Birmingham, UK) and viewed using epifluorescence microscope (Nikon Eclipse E600, Nikon Instruments Inc., Tokyo, Japan). TEM examination was done on glutaraldehyde-fixed renal biopsy tissues stained by uranyl acetate-lead citrate and viewed using the Philips Morgagni 268 electron microscope (FEI, Eindhoven, the Netherlands). Digital images of IF-stained sections were captured using Olympus DP71 image capture device with dedicated software (Olympus Corporation, Tokyo, Japan). Images were further modified using adobe photoshop elements (version 5.0) software (Adobe Systems, San Jose, CA, USA). Fluorescent images were inverted using the Filter → Adjustments → Invert (keyboard shortcut Ctrl+I) sequence. The inverted image was then converted into gray scale by selecting the Image → mode → Gray scale functions, and adjusted using the Enhance → Adjust lighting → Brightness/contrast sequence until good visualization of IC deposits was achieved. This technique is illustrated in [Figure 1] (with corresponding TEM image in [Figure 2]). Image was then magnified as appropriate to optimally localize the IC deposits. Figure 1: A panel of photomicrographs depicting the technique of inversion of the immunofluorescence image: (a) the original IF image with capillary wall granular deposits of C3; (b) the same image after inversion; (c) the gray-scale mode of the inverted image; (d) magnified view of the image showing intramembranous deposits (arrows) along with sub-endothelial deposits (arrowhead). 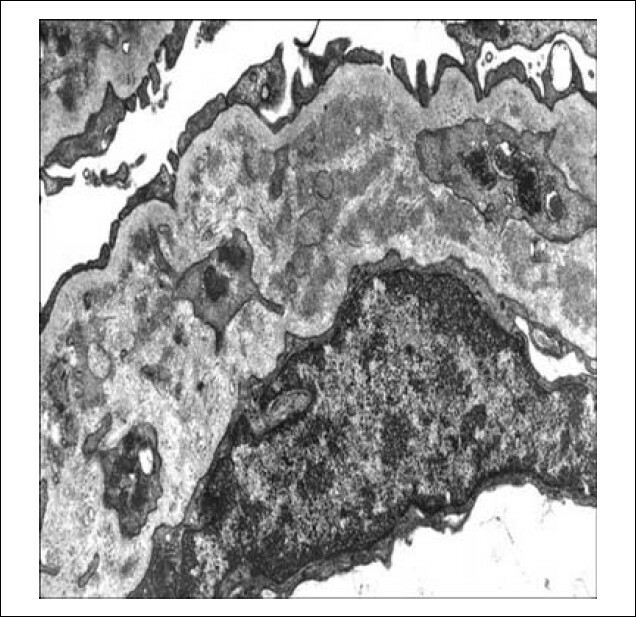 Figure 2: Electron micrograph of the same case as in Figure 1 showing both intramembranous and sub-endothelial deposits (×4500). For all the cases, clinical features and bio-chemical parameters including serum urea, creatinine and urinary protein excretion at the time of biopsy were recorded. Appropriate statistical methods were applied to assess the correlation between localization of IC deposits by IF image inversion and TEM. The clinical and laboratory parameters in the various disease categories were also compared using appropriate statistical methods. The mean age of the study patients was 25.5 (±7.2) years with male:female ratio of 1.2:1. The correlation data of IC localization using the image inversion technique and TEM is tabulated in [Table 1]. As depicted in the table, there was a near perfect correlation between IC localization by IF-image inversion technique and TEM, with a kappa of 0.90. The best correlation was found for mesangial deposits of IgAN and sub-epithelial deposits of MGN [Figure 3] and [Figure 4]. In one case each of lupus nephritis, sub-endothelial deposits (by TEM) were assessed as intra-membranous by IF-image inversion. The salient clinical and bio-chemical parameters are depicted in [Table 2]. Table 1: Immune complex localization by IF-image inversion and electron microscopy. Table 2: Clinical and laboratory data at presentation. Figure 3: Photomicrographs showing capillary wall granular deposits (a) following inversion; (b) magnified view of gray-scale image; (c) demonstrating sub-epithelial deposits (arrows) in a case of membranous glomerulonephritis. 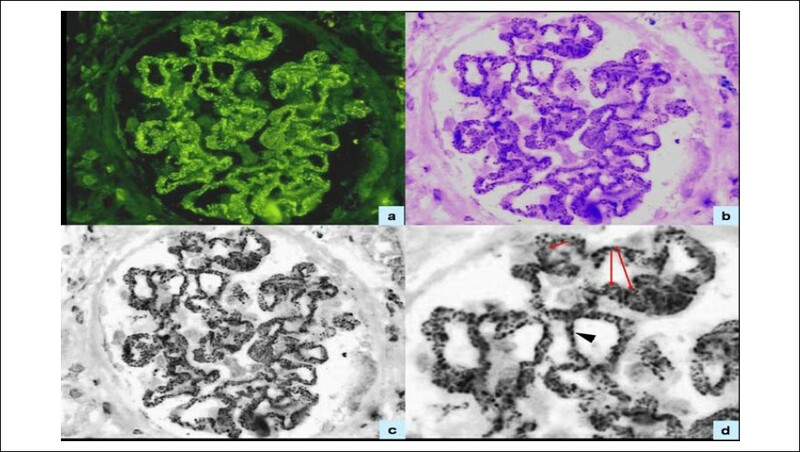 The lower panel shows strong capillary wall deposits (d) inverted image (e) gray-scale image depicting sub-endothelial deposits (f, arrows) in a case of membranoproliferative glomerulonephritis. Figure 4: A case of IgAN showing mesangial deposits on IF (a) image inversion (b) followed by grayscale image shows focal capillary wall deposits (c, arrows). Approximately 85% of all glomerular diseases, both primary and secondary, are immune mediated and almost all of these are associated with deposition of IC in the glomeruli. Detection and demonstration of these deposits is mandatory for proper classification of renal diseases. Accurate localization of IC deposits is of clinical significance in diseases like IgAN, lupus nephritis, MPGN, etc. In IgAN, a number of studies have shown worse clinical outcome in patients with peripheral capillary wall deposits. , In patients with lupus nephritis, sub-endothelial deposits correlate best with clinically active disease. However, the localization of IC deposits is usually less than satisfactory in the absence of TEM. A few techniques like fluorescence of H & E-stained frozen sections of renal biopsies have been attempted but were not sensitive enough for the localization of deposits. 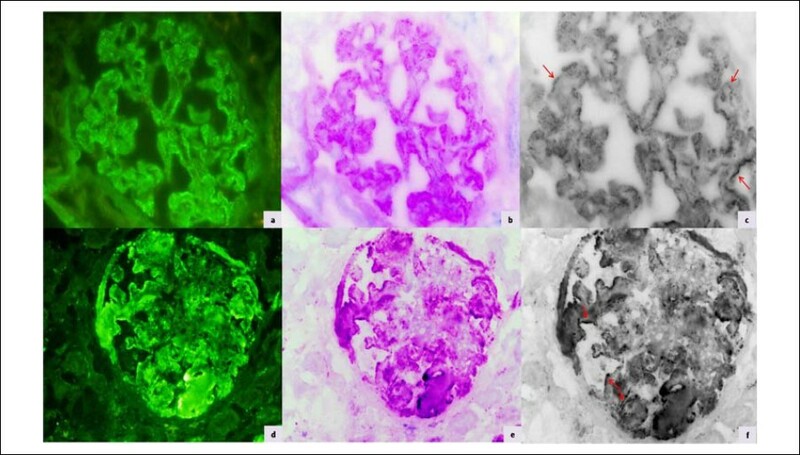 A study by McMohan et al utilized the fluorescence microscopy of H & E-stained sections of renal biopsies fixed in Hollande's fixative (3.7% formalin, 40% picric acid, 25% copper acetate and 1.5% acetic acid). Although this technique was shown to be useful for detection of IC deposits, exact localization was not attempted. In addition, Hollande's fixative is not used routinely in many centers. In the present study, we have utilized a simple technique of image inversion applied to the routine IF staining and digitally captured images. A good correlation was found between this technique and the localization of IC deposits by TEM. This relatively simple technique (requiring only an image capture device and an image processing software) can be used as an adjunct to IF examination of renal biopsies, especially in centers not equipped with TEM facilities. Since the technique is relatively simple, intensive training for the use of this method is also not required. In conclusion, the present study describes a simple technique of digital inversion of IF images to assist in localization of IC deposits in renal biopsies, even in the absence of facilities for ultrastructural examination. Accurate localization of IC provides significant clinical and prognostic information to the nephrologists in diseases like IgA nephropathy and lupus nephritis. The authors acknowledge the CSIR for research grant support as research associates. The authors wish to acknowledge the staff of Electron Microscope Facility at the All India Institute of Medical Sciences for their help in ultrastructural examination of the renal biopsies. The authors also wish to thank Dr. Sompal Singh for his valuable assistance in statistical analysis. 1. Walker PD, Cavallo T, Bonsib SM. Practice guidelines for the renal biopsy. Mod Pathol 2004;17:1555-63. 2. Bartosik LP, Lajoie G, Sugar L, Cattran DC. Predicting progression in IgA nephropathy. Am J Kidney Dis 2001;38:728-35. 3. D'Agati VD. Renal diseases in systemic lupus erythematosus, mixed connective tissue disorders, Sjogren's syndrome and rheumatoid arthritis. In: Heptinstall's Pathology of the Kidney. In: Jennette JC, Olson JL, Schwartz MM, Silva FG (eds). 6 th ed. Philadelphia: Lippincott Williams and Wilkins, 2007,538. 4. Bonsib SM, Reznicek MJ. Renal biopsy frozen section: A fluorescent study of hematoxylin and eosin-stained sections. Mod Pathol 1990; 3:204-10. 5. McMohan JT, Myles JL, Tubbs RR. Demonstration of immune complex deposits using fluorescence microscopy of hematoxylin and eosin-stained sections of Hollande's fixed renal biopsies. Mod Pathol 2002;15:988-97. 6. Li PK, Ho KK, Szeto CC, Yu L, Lai FM. Prognostic indicators of IgA nephropathy in the Chinese: Clinical and pathological perspectives. Nephrol Dial Transplant 2002;17:64-9.